Award recipients are selected from the entire regional pool of male and female athletes by a popular vote of coaches and event staff. The 2017 Flyin Ryan Award recipients Andreya Zvonar and Parker Herlihy were on hand to assist with the presentation. 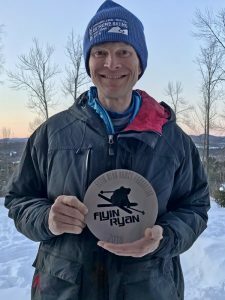 The laser cut metal plaques were presented during the awards ceremony for the 2-day Jay Peak IFSA Junior Regional 1*and FWQ 2* Extreme Competition at Jay Peak Resort in Vermont, more popularly known as the Ski The East Freeride Tour Championships, the final event of the season in the Eastern region. Jordan Conrad is from Newtown, CT and goes to Newtown High School. 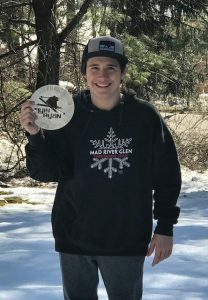 Jordan is an IFSA Junior competitor in the 12-14 age category from the Mad River Glen Freeskiing Team. Matteo Campbell lives in Cambridge, Vermont with wife Stephanie and children Ila and Reuben. Matteo is an adult competitor and senior Freeride coach of the Smugglers’ Notch Ski and Snowboard Club. Core Values Matter – These three words are the mantra for the Flyin Ryan Hawks Foundation. The 14 Core Principles for Living, as written down by Ryan Hawks before his death, provided him with a compass to guide his decision making, whether in sports, school, relationships or other aspects of daily living. People with an established, self-composed set of Core Values have a touchstone, a reference point for making decisions, big and small. For more information on the Flyin Ryan Foundation go to www.flyinryanhawks.org. Make sure to check out the Core Values Challenge, Adventure Scholarship, and Decisions programs!